Studio 74 at the Exeter Phoenix was packed to its indie rafters for the event. And there were queues outside to try to catch the programme during another pulsating Two Short Nights film festival in the city. The local talent screening had also managed to entice the filmmakers themselves to say a few words after their films. Temperature seemed a common theme in their filmmaking travails. There were tales of cold times spent in various locations: the seaside, up a hill, and a bus stops. One of the filmmakers told of how they skulked in bushes trying to nab their editor. And the audience heard how difficult it is to get a second-hand coffin. Not surprisingly, it was this screening that produced the Two Short Nights audience award winning film in the shape of Cut From Cloth. Luckily, D&CFilm had managed to nab some of the filmmakers for few words. 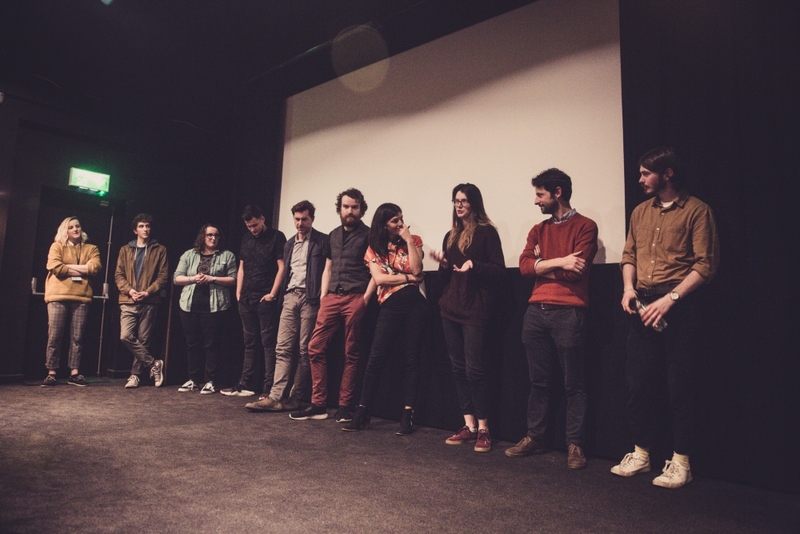 Here’s a run down of the screening for the local talent and emerging filmmakers from across the South West. Directed by Rebecca Gosnell, Gloria stars a Eileen Davies as the frail and resilient main character. It’s ‘a shocking portrait of one woman’s fight against prejudice, grief, and loneliness’. Resilience is stretched in Serpentine, Grace Fox’s film about a Cornish fisherman coming to terms with a great loss. We spoke to Grace about Serpentine, covering issues of love, loss and grief. Family relationships are under stress in Cut From Cloth directed by Tommy Gillard. This film picked up the audience award for the whole Two Short Nights 2018. We caught up with producer Simeon Costello to talk life and death issues. A Somerset town doesn’t seem a likely candidate for a new Area 51, but that doesn’t stop brother and sister Cybil and Hammond in their search for aliens in Paddy Earle’s Intelligent Life. We caught up with Paddy to talk about hope and dealing with scepticism. Chris Jones, Guy Natanel and Benjie Croce share directing credit on This Is Phonic, the first film from their Preston Street Films production house. It’s a fascinating look behind the scenes of Exeter’s community radio Phonic FM, full of enthusiasm, passion and personalities. We chatted with Chris about the film and the wealth of human experience he found. Resolutions sees two very different women find common ground at the end of New Year’s Eve celebrations. Director Heidi Jones told us about the inspiration she finds through working with such talented people, and it certainly shows in the film. A crisis situation is bad enough. Add to that a fatal accident, a talkative constable and an unwelcome guest and you’ve Sump, Mike Wozniak’s comedy. The Two Short Nights Local Talent encore screening is at the Exeter Phoenix on Sunday, December 16 at 1pm. Get your tickets on the Exeter Phoenix site.